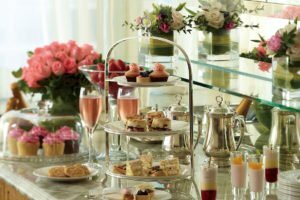 With Auckland’s long-standing Langham Hotel being rebranded into a Cordis in 2018 despite the fact that new Langham-branded properties still opening around the world (the Business Bay, Dubai location should be open to the public within the next 12 months), we’ve been pretty curious as to what’s happening in the world of all things Langham. Our trip to Macau for the 2019 Asia’s 50 Best Restaurants awards was the perfect excuse to swing by Hong Kong and delve a little deeper. We discussed the branding changes with the Langham team over lunch at their three-starred Cantonese restaurant, T’ang Court (you can read more about that meal here) and they quickly clarified the changes for us. Langham Place hotels and selected Langhams have been rebranded under the Cordis brand, which will sit a level below the flagship Langham brand and cater to a more modern, younger crowd, while the remaining Langhams will continue to espouse the values and aesthetics of old school luxury (with their signature revamped take, of course). 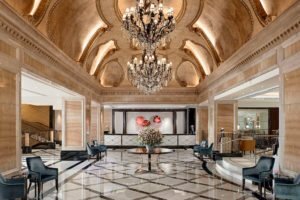 Speaking of revamped, the Hong Kong Langham was renovated in 2016 with some spectacular results. (Bear in mind though, this renovation applies to rooms in the Deluxe category and above, the Superior category has not been renovated so you may wish to avoid these rooms.) These renovated rooms are nothing short of, well, absolutely delightful. Soft pastels mingle with antique metals, marbles and calming imagery of flora and fauna. Our one bedroom suite, despite clocking in at a conservative 59sqm, does amazing things with the space it has. Given that the property is 30 years old, it’s naturally more compact than say, some of your recent-build St. Regis properties for example, but it sure packs a punch in the space it does have. With a foyer and lounge that are petite yet really very comfortable, this is a suite that punches well above its advertised weight. It’s not dissimilar to the size of the Hong Kong Four Season’s Executive suites, but definitely one-ups it when it comes to decor (even if it doesn’t have those breathtaking harbour views). Need sleep? The Langham has got you covered. The beds are ridiculously comfortable as are the sheets and pillows – the pillows are so good that we even tossed our own pillow aside (that’s the pillow we bought from Trisara in Phuket that we drag literally everywhere around the world with us). 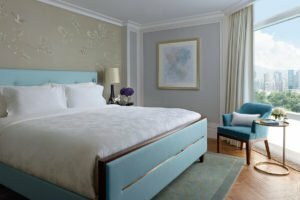 We compared the Langham HK’s pillows to our own and it was a perfect match. A pillow that doesn’t give us neck ache? A rarity these days, even in luxury properties. Need power? No worries here either. Not only does the Langham have dual USB ports on both sides of the bed, they also supply a variety of charging cables (you’ll find them tucked away in a desk drawer) and there are an abundance of powerpoints all around the suite (note that these are all UK powerpoints – we’d love to see a couple of international sockets). 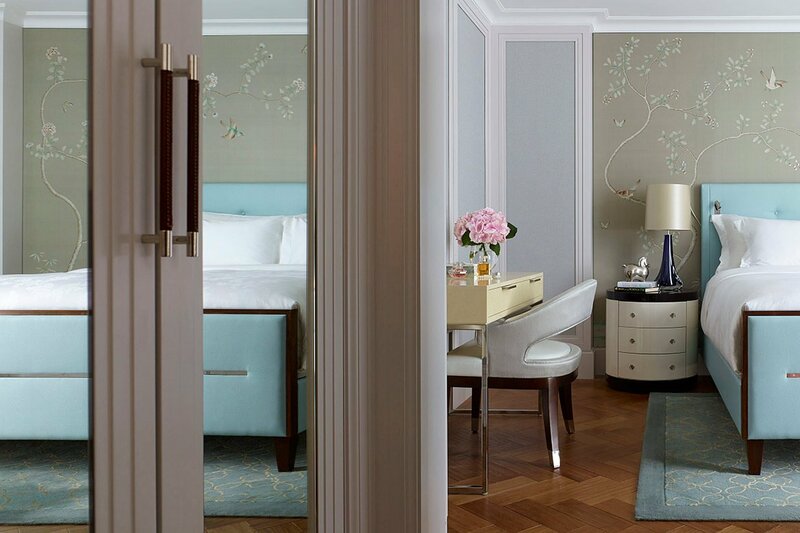 Amenity wise, the Langham uses their in-house spa brand, Chuan, and its ginger flower fragrance. Not particularly bold or memorable, but pleasant all the same. You’ll find just what you’d expect at a luxury property – toothbrushes, razor and combs are provided, and all suites will also find a tower of sweet bites waiting for them in their room to have alongside a Nespresso. The in-room surprises don’t stop with sweet bites, however. Our evening turn-down amenity was rather impressive – a satchel full of Asian beauty supplies including cooling foot pads, heating pads for sore necks and shoulders and under-eye patches to help relieve that jetlagged look. It’s the first time we’ve seen something like this at a hotel and we’re living for it. Of course, there’s a great fitness centre and rooftop pool, as well as an in-house Spa. We tested Chuan’s massage and while the massage itself was fantastic, given that the spa is so small (there appears to be just one treatment room for men and one for women), there was an element of the pampering experience we want from a spa missing – check-in was made standing at the reception of the fitness centre, and there really wasn’t space to relax in after (or private change rooms). It didn’t feel like the Chuan Spa experience that we’ve come to know from Langham properties, but again, the massage was very good all the same. There are yet more benefits that come with booking a suite at the Langham Hong Kong, one of which is garment pressing. We think this is such an important perk when you have a busy schedule and one we value highly. 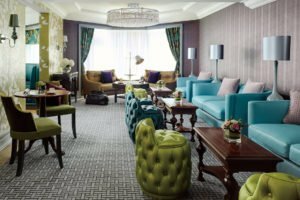 The Langham offers three pieces of pressing per stay, and ours were returned within 4 hours. An even more significant perk, however, is the Langham Club access. This is a benefit that really does impress. 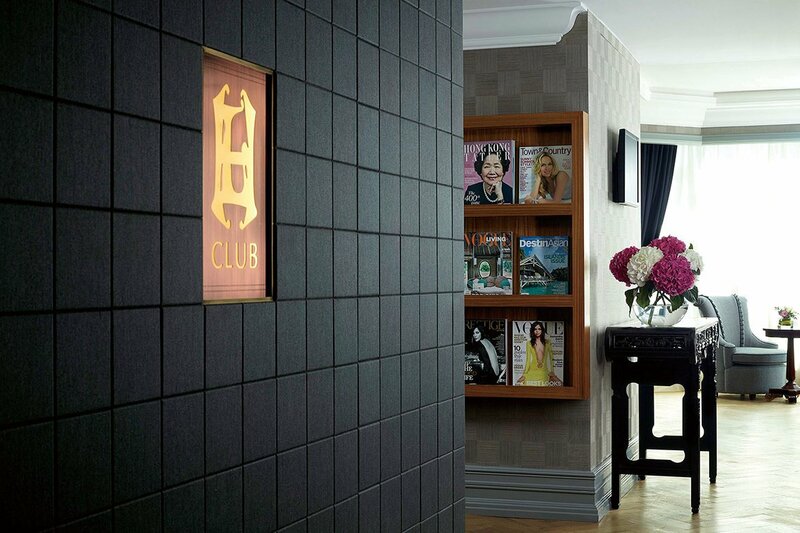 Firstly, the Club, located on the 11th floor, is beautiful. 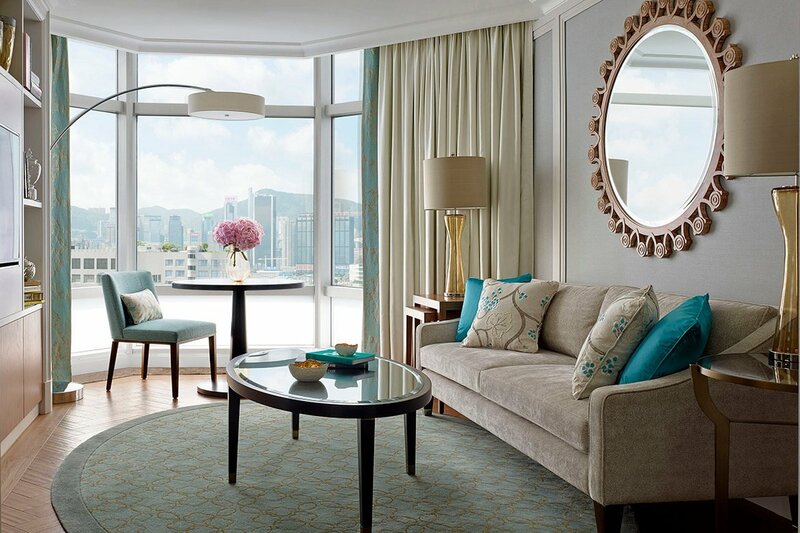 It’s styled in a romantic-old-school-Hong-Kong vibe and feels intimate and luxurious. Suite guests can check in at the Club (where you’re presented with a soft pink rose, a Langham signature), which was admittedly quite the respite from the hectic entrance lobby. But, that’s just the beginning. 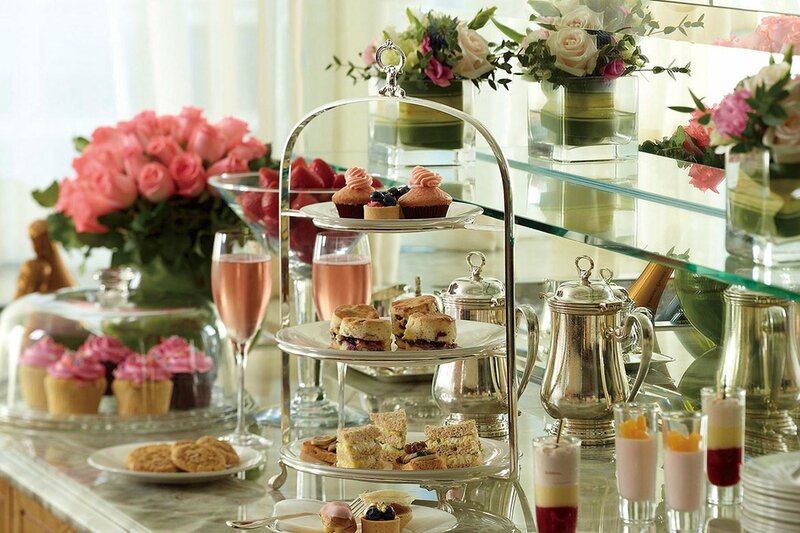 The club provides food and beverages (including alcohol) around the clock, starting with breakfast and followed by afternoon tea and a cocktail ‘hour’. Between 6-8:30pm daily – hence ‘hour’ in moniker only – the lounge serves up a lovely spread of charcuterie (we loved the tender prosciutto), cheeses (on the milder side of things, just how we like them), canapes and hot snacks. The drinks are equally high quality, with an array of wines, beers and spirits on offer – most notably for our tastes, Perrier Jouet Champagne and Peroni beer. The Langham isn’t messing around. The service is just as impressive – on our second night, the lounge staff remembered what we’d ordered the night before and ensured water and Champagne was delivered to our table, as well as two tables joined for working space, just as we’d had it the evening before. 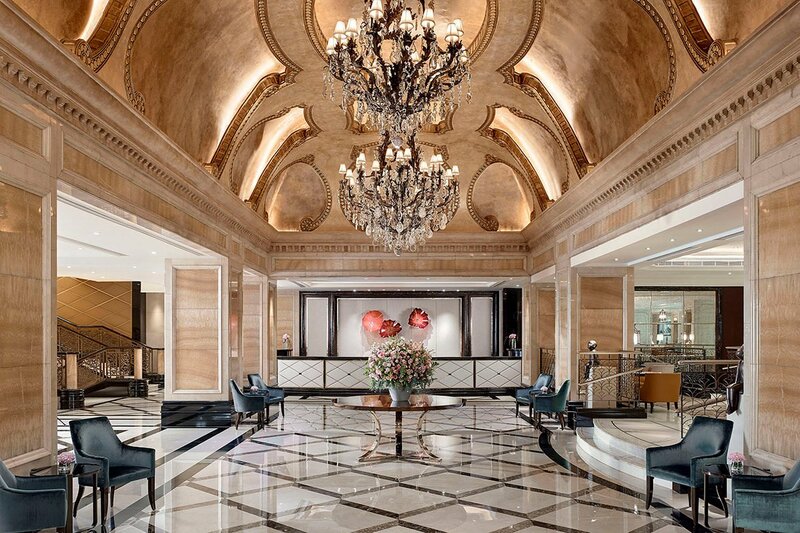 Just another example of why the Hong Kong outpost of The Langham is truly espousing bespoke luxury. Our only gripes? The closets in the suite aren’t quite deep enough to fit modern suitcases so our suitcase ended up sticking out slightly, setting off the closet light all day and night. Didn’t really add to that oh-so-dark serenity that the blackout curtains aimed to achieve. Similarly, we couldn’t quite get rid of the hallway nightlight – we’d love to have seen a door on the bedroom to close off the light pollution from the hallway and bathroom. The other issue that the hotel faces is location. On one hand, it’s located superbly, right in the shopping heart of Tsim Sha Tsui, but on the other hand, it might be on the wrong side of town for you as it ended up being for us – all the restaurants and bars we needed to visit were over the other side of town near Central which was a bit of a pain. It wasn’t the end of the world for us, but if Kowloon is your focus, then this is the perfect hotel for you. Overall, would we recommend The Langham? Absolutely! 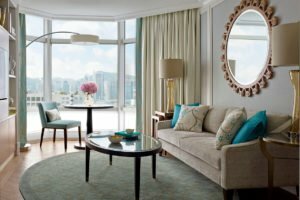 Stunning rooms, impeccable service and amazing club facilities make this one of Hong Kong’s very best properties. We’d stay again in a heartbeat.